Large rear deck for entertaining and tables for outdoor dining. Large Family Room with TV, games, and music. Open floor plan is great for socializing and family time. Open Kitchen/Breakfast Bar makes for easy cooking and serving. First Floor King bed with premium linens and full bath access. Second Floor King Bed is a great resting space after the beach. Upstairs overflow space for guests. Second Upstairs Bedroom with twin beds, dresser, and TV. Overflow space with futon and work desk in twin bedroom. 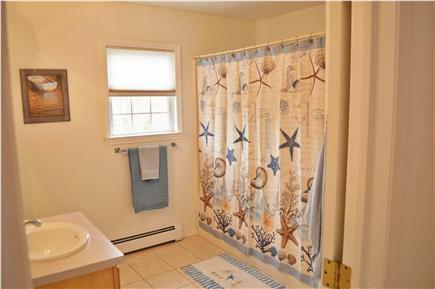 Second Floor full bath with deep soaking tub and shower. The Famous South Beach with it's black sand and high surf. New to the rental market is our 3 bedroom, 2 full-bath Cape centrally located in Edgartown on the bus line and bike path providing easy access to all the major towns on the Island. Our home sleeps 8 comfortably and is located on a dead end street with no vehicle traffic, adding maximum privacy and quiet. The house is designed with an open floor plan with enough space for socializing and family gatherings. Our kitchen provides plenty of cabinet space and all of the appliances you will need for family meals and happy hour. The living room provides a comfortable seating area, and the dining room has a breakfast bar and a sliding glass door leading to a large mahogany deck for outside entertaining. There is a huge outdoor shower with separate changing area for washing off the sand from the beaches. The first floor bedroom has a king bed and private access to the first floor bathroom and a walk-in closet. Upstairs has another full bath and wall-to-wall carpeting for added quiet. Our upstairs bedroom suites have overflow space for guests. One king bedroom suite has a trundle with two twin beds. The other suite provides two twin beds and a full size futon. We provide full linens. Our home is located in an area of Edgartown that is convenient to all parts of the island. We are located directly on the bus line and the bike path that stretches from Vineyard Haven to the center of Edgartown. A few yards from the back of the property is an area of conservation land with 80 acres of marked walking trails. It is a protected area with tons of wildlife and several unique species of birds. This protected area abuts the Vineyard Golf Club.Two blocks up the main street 4 minutes away is Felix Neck.This beautiful and quaint spot is home to a Mass Audubon Wildlife Sanctuary. It is home to the one of the largest birds on the island, the Osprey. You can birdwatch, kayak, and canoe through this unique spot connected to the pond. It is kid friendly with live animal exhibits and habitats. There is over four miles of marked trails for hiking and birdwatching.There is also a picnic area and a snack bar. Golfers will be particularly interested in our location because we have three premium Golf courses within minutes from our home. The Edgartown Golf Club is at the end of the Edgartown Vineyard Haven Road. This Golf club is located a mile away and is situated along the Atlantic side of the island.The Vineyard Golf Club is located behind us about 1-1/2 miles away on the Edgartown Road. The world famous Farm Neck Golf Club is located 6 minutes away in Oak Bluffs.This is the golf course where President Obama and Bill Clinton played. ''This ocean-side tract delivers what some would argue is the best coastal golf experience anywhere ...You’ll get no argument here.'' (Golf Boston Travel and Leisure). Beach lovers get ready because our location will give you the best routes to the beaches while avoiding the island traffic. State Beach is a 4 minute drive away. This beach stretches from Edgartown all the way to Oak Bluffs with free parking on the marked pavement. The bus stops at the end of our street and makes several stops along this beach. The infamous ''JAWS'' bridge is located at this beach and it is one of the island's traditions. Lighthouse beach is located in the heart of Edgartown Harbor. This beautiful spot puts you in the action of one of the island's ports. Here you will see boats of all sizes coming and going throughout the day. You will also get to witness the lifestyles of the rich and famous with their multimillion dollar motor yachts, some stretching well over 100 feet. As you walk around the harbor you will overtaken by the beautiful architecture of the town. The Captain's Houses are all beautifully restored and all are period correct white with black shutters. Some of these are priceless and date back into the 1800's. There is also the ''Chappy'' ferry located here that is just large enough to hold 3 cars and some bicycles. This ferry travels no more than 300 feet to Chappaquiddick island. This is a busy area so swimming can be tricky due to currents and marine traffic but a spot you must see. South Beach is an island must see due to its black sand and high surf. This is the southern most part of the island so there is always a breeze and waves. This is a 12 minute drive from our house but also accessible by the bus route(s) at the end of our street. South Beach is great for surfing, boogie boarding and playing in the waves. There are many smaller unique beaches on the island and we have a description and a map of all of those in a renters binder. These beaches are island ''GEMS'' off the beaten path and away from the tourists destinations. For those who are looking for the best location offering easy access to any point on the island and a house offering great amenities, this is the house for you. Your great vacation awaits. Book now!!! First floor king bedroom with private access to the first floor full bath with tub and shower. This bedroom also has a walk in closet. Our family stayed during the very busy week of Aug 12. We have vacationed on MV many times before, but this was, by far, the best time we've ever had. We booked our trip not knowing we would get to experience Illumination Night in Oak Bluffs (which will now be our new yearly family tradition), the Agricultural Fair and also fireworks night. How lucky we were to get to experience all 3 in one week! When we arrived at the home, we all were pleasantly surprised with how clean and welcoming the owners made it. We arrived a bit early and were greeted by Roger, who instantly made us feel right at home. He gave us great tips and suggestions! The beds and linens were very comfortable and everything was available such as beach chairs, umbrellas, outdoor games, etc., to make our stay even more enjoyable and stress free. We loved your home. From top to bottom, everything was super. The kitchen is well stocked with all the items you need to cook in or out. The gas grill was in fine working order although we ran out of propane, but extra tank in basement did the trick. There were plenty of toys, games and dvds for the kids to enjoy. We loved! the outdoor shower! Great private dead end street so no worry about the grand kids in the street. The back deck is a perfect retreat after a long day. Loved the lighting and comfy cushioned patio furniture. We are so happy that you enjoyed our home and had a great vacation. Thank you for letting us know about the hand towels as we do supply them. Unfortunately, the cleaners must have forgotten to put them out. We appreciate your kind words and feedback. Have a great rest of your summer!